Stearns County in Minnesota, located around the St. Cloud area, is an unassuming, rolling-hills-and-farms landscape with occasional lakes and woods. Interstate 94 cuts right through the heart of it with St. Cloud being the economic hub of the area. 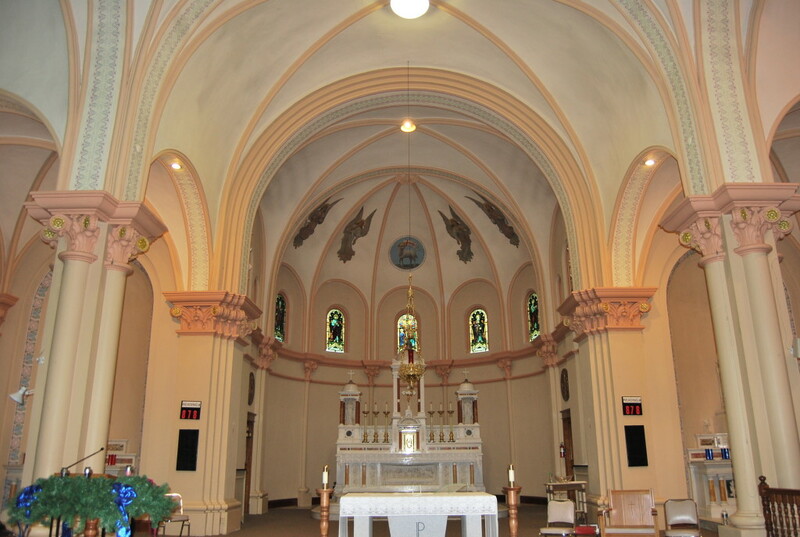 Most people don’t know about its hidden gems – its churches. 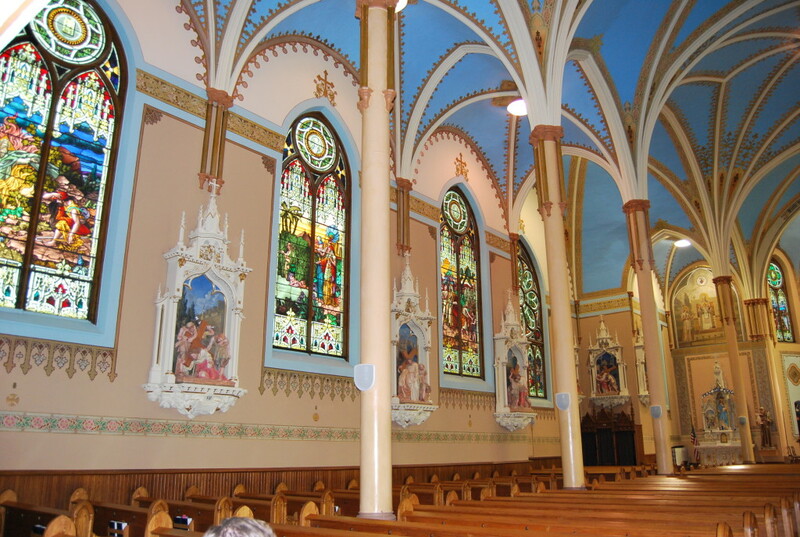 There are 52 Catholic churches in this county, which was heavily settled by Germans in the late 1800’s. 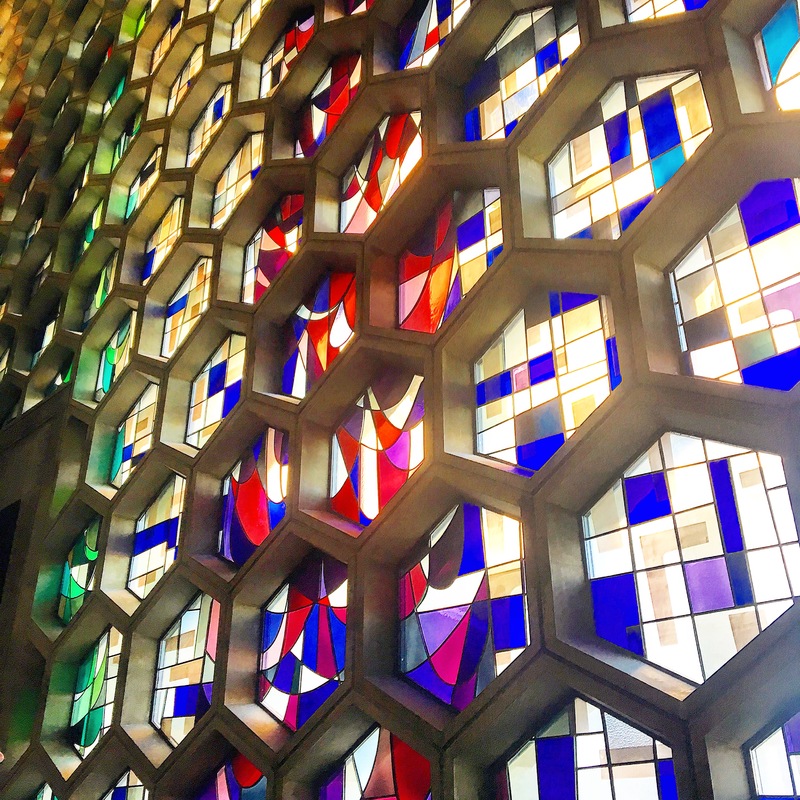 After recently reading a book about these fascinating places of worship, HighwayHighlights took a roadtrip to explore them in person. We were blown away by what we found, and here are the Top Ten. 10. Church of the Immaculate Conception, New Munich, MN. 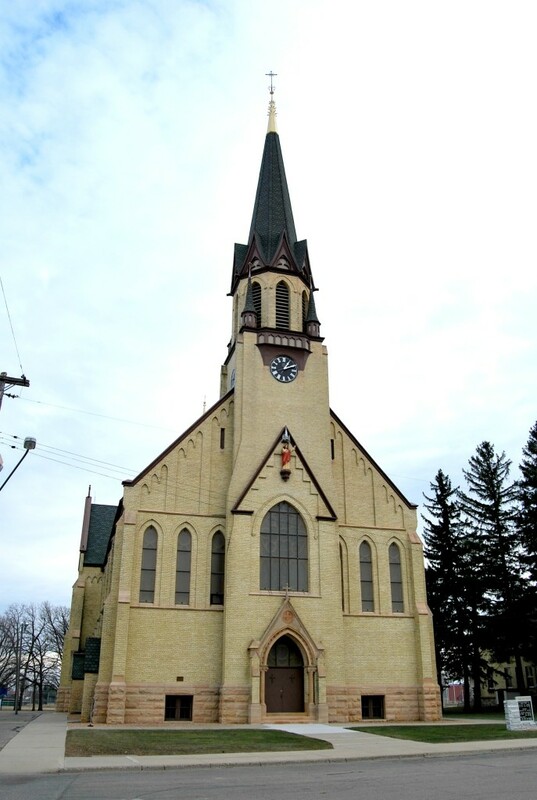 The Catholic Church in New Munich, MN stands on the main road through this tiny town of about 300 people. It was completed in 1911. 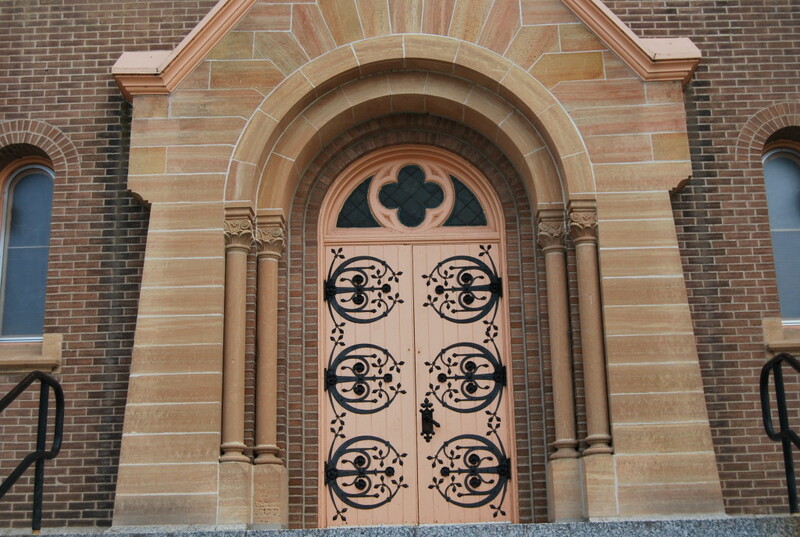 The facade of the church features two square steeples and its elaborate doors feature metal vignettes that harken back to the churches of Germany and other parts of Europe. 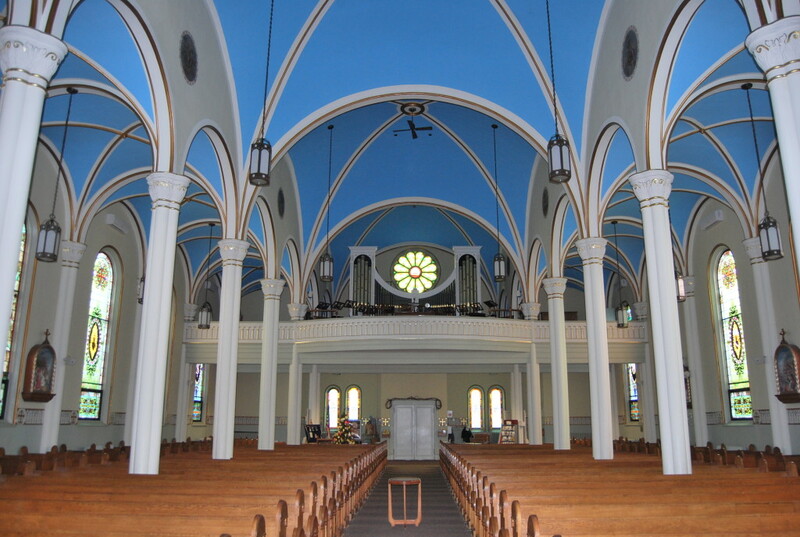 The interior features vaulted, pinkish colored ceilings and eloborate stained-glass windows. 9. 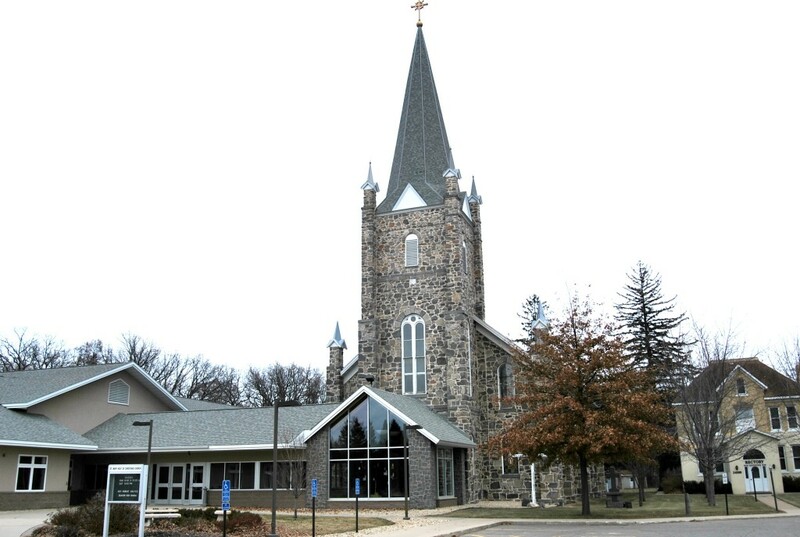 St. John’s Abbey, Collegeville, MN. 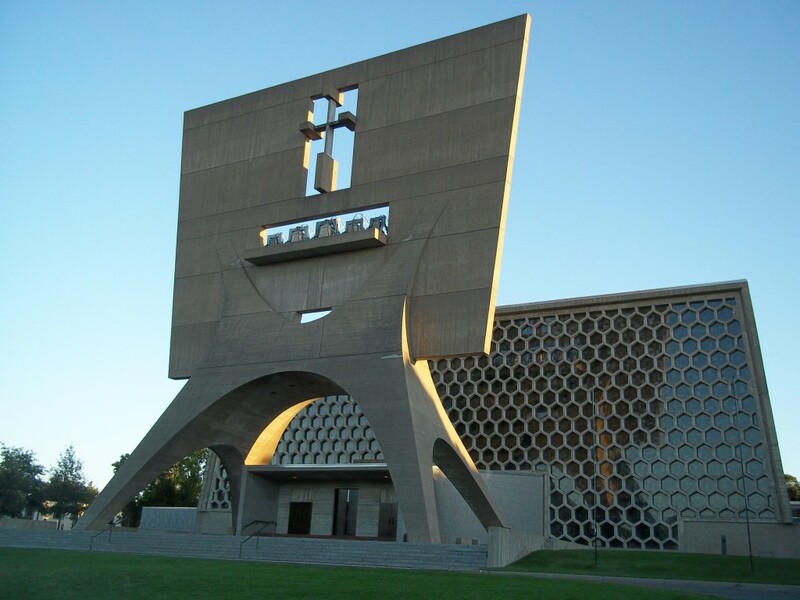 The grandeur and expansiveness of this blocky centerpiece of St. Johns University made it a top-ten no-brainer by default. 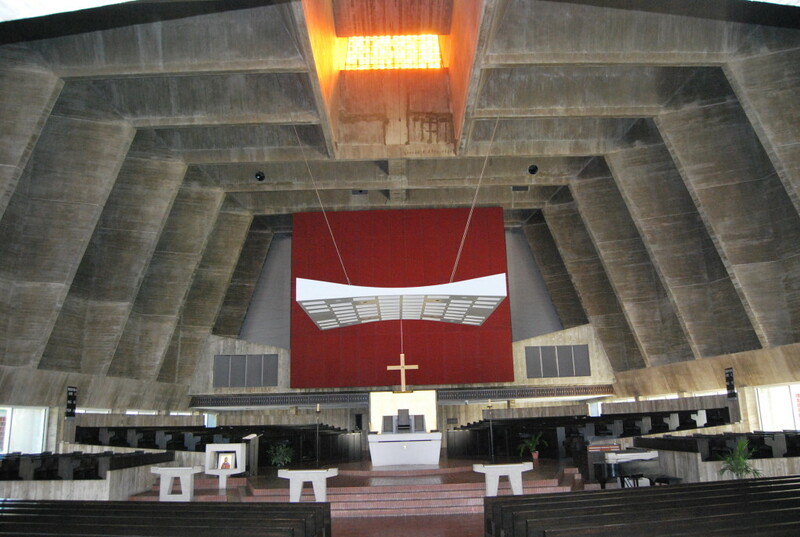 Although much more modern (built in 1961) than most other churches in the area, the St. John’s Abbey church with its concrete bell banner out front and its honeycomb of stain glass windows make for a beautiful contrast with its bold, symmetrical interior. This church is a great example of the post Vatican-II movement, which basically forbade any fun, colorful, detailed art that supposedly distracted from the true meaning of Catholic mass services. It has a Cold-War-esque feeling with its mix of Brutalist/Moderne architecture. .8. Assumption Chapel, Cold Spring, MN. Also known as the Grasshopper Chapel (more here), the Assumption Chapel was built in 1951 after the previous chapel was destroyed by a tornado. The pretty little chapel on top of a wooded bluff has an interesting history- it was built in response to a last-ditch effort of a day of prayer to end a grasshopper (locust) plague that devastated the area in the 1870s. The prayer worked, the grasshoppers died off, and this is memorialized in a stone inlay above the door. 7. 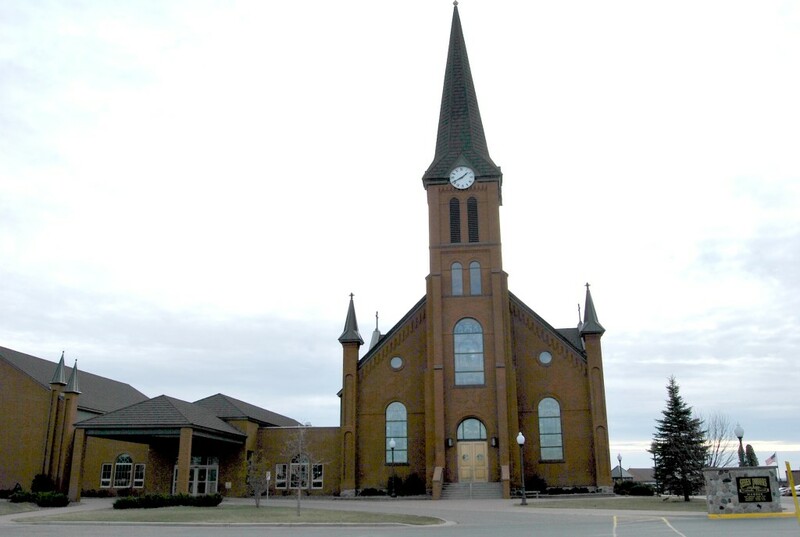 Church of St. Mary Help of Christians, St. Augusta, MN. 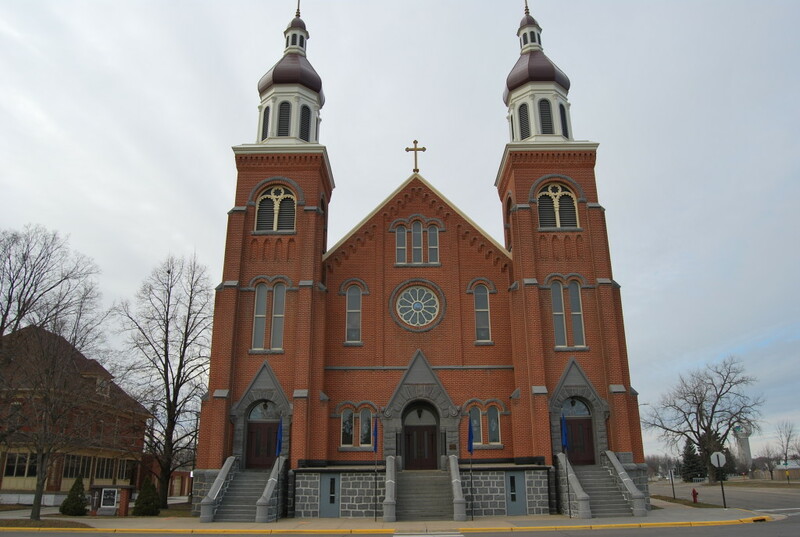 Built in the 1870s with locally-quarried granite, the Church of St. Mary, Help of Christians features Gothic-style architecture with additions to the front and side added on much later. Although somewhat unassuming from the outside, the ornate, intricate tabernacles, side altars, and confessionals show remarkable detailing of the hand-carved woodwork so carefully done. 6. Church of St. Paul, Sauk Centre, MN. 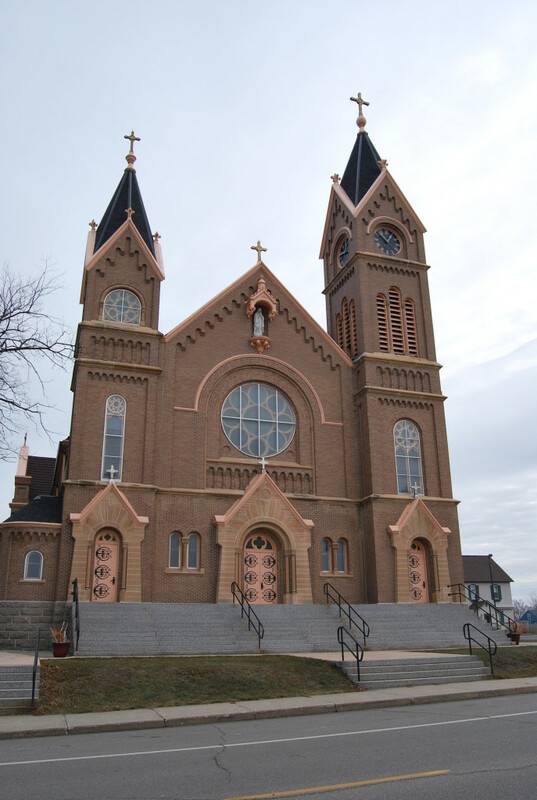 One of two unique and beautiful Catholic Churches in Sauk Centre, the Church of St. Paul has a traditional Gothic-styled exterior commonly found on churches built during the late 1800s, this one being completed in 1899. But its rich, colorful altars and tabernacle set the tone of the this intimate, cozy, little church. One gazes in wonder at the detail of the spires, arches, and figures of the altarpiece. 5. 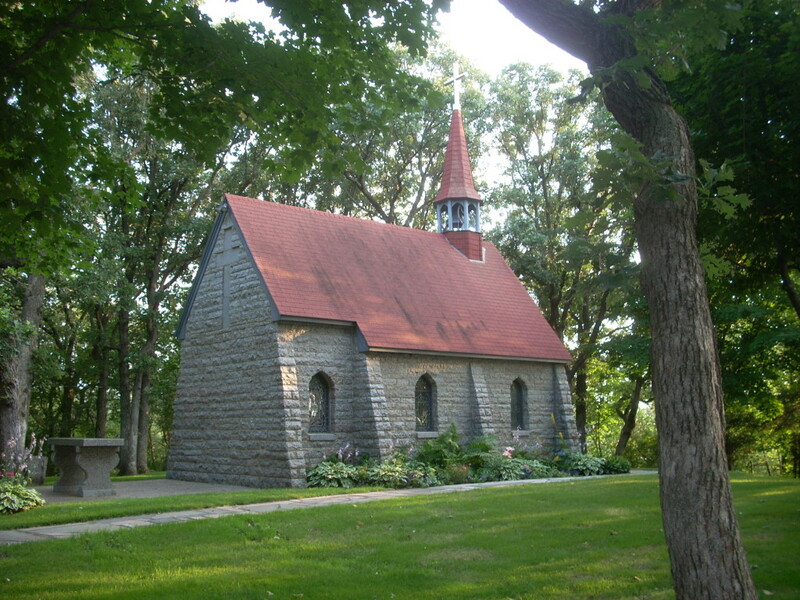 Church of St. John the Baptist, Meire Grove, MN. Just a few miles south of the Interstate is Meire Grove, another dot-on-the-map town with a curious church. This one seems to have a more Spanish-influenced feel to it, although its architecture is said to be Baroque in style. 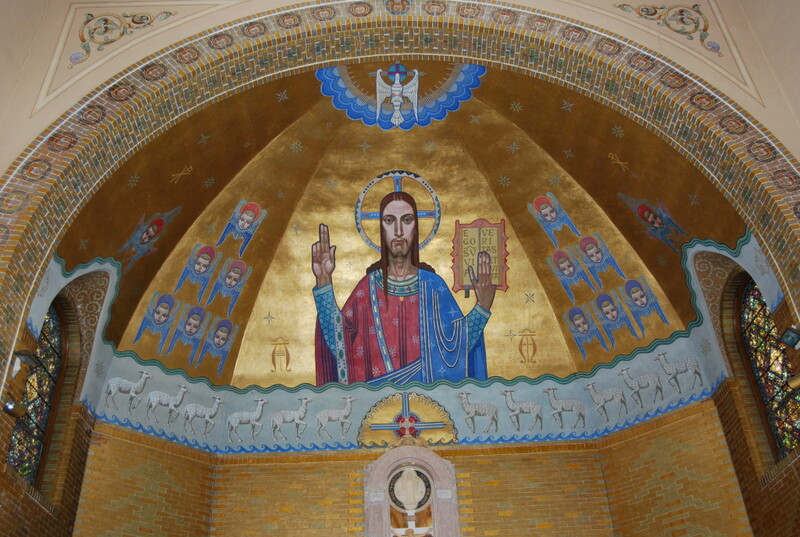 Built in the 1920’s, the interior features an apse of gold-painted bricks with a large depiction of Christ as well as his apostles. 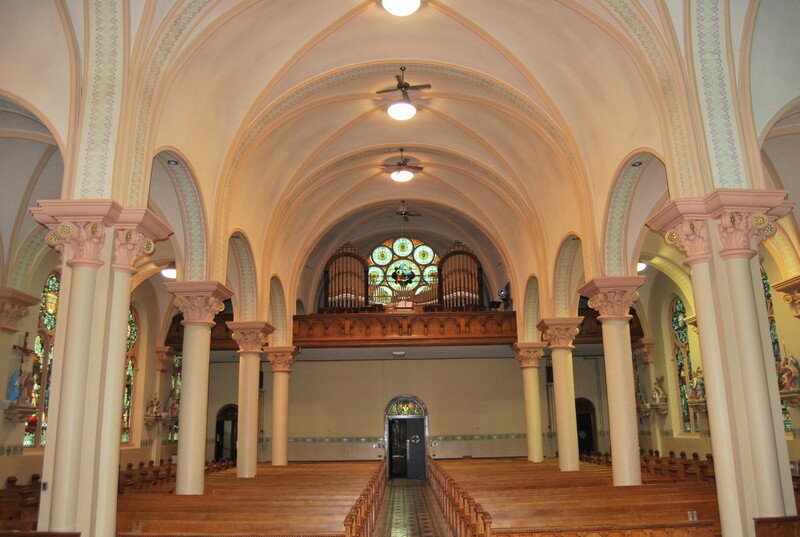 The nave of the church features bricked arched columns and an open, airy, feel. It’s beautiful. 4. 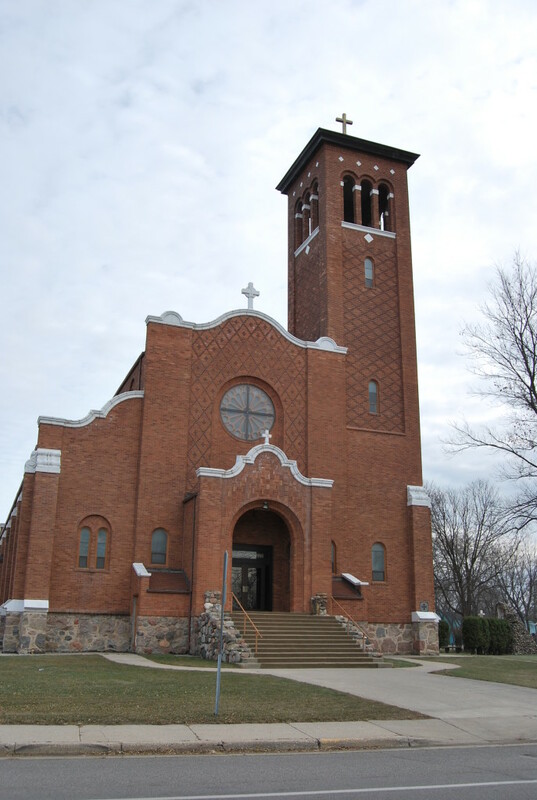 Church of the Seven Dolors, Albany, MN. 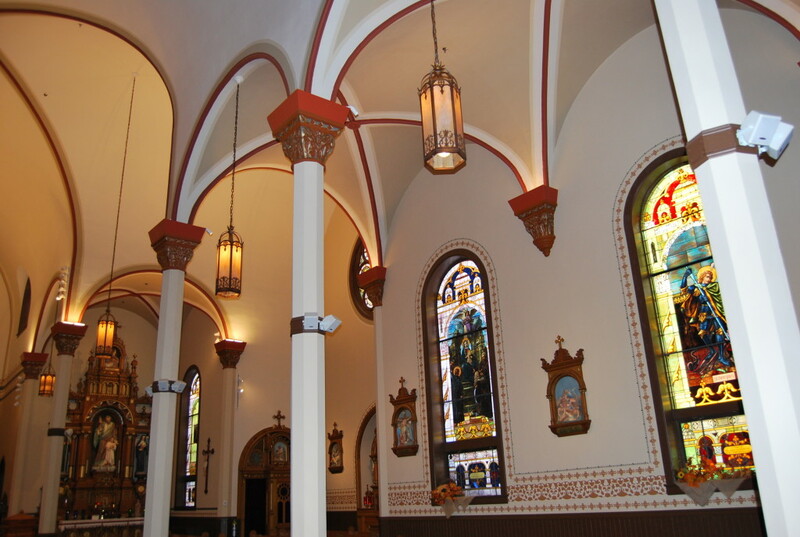 Another impressive church on the list, the Church of the Seven Dolors in Albany also features the eloborate woodworkings of the altar and tabernacles that set these churches apart from your run-of-the-mill modern churches so common today. 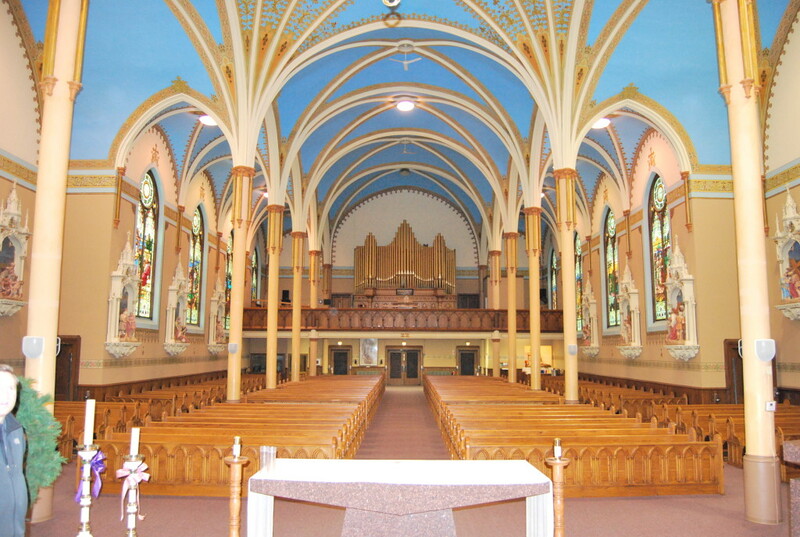 Much like the churches in St. Augusta and Sauk Centre, the arched ceilings and stained glass windows take a backseat to the opulent design of the sanctuary, a visually stunning work of art. It was officially dedicated in 1900. 3. Church of St. Mary, Melrose, MN. The Catholic church in Melrose is classically beautiful on the outside, with its pair of twin steeples and red brick design with Romanesque features. Construction on it was completed in 1899. A sign near the door tells that it was listed on the National Register of Historic places in 1993, for good reason. But the inside of the church is even more beautiful, with blue-painted ceilings and its ethereal sanctuary dome, designed like stars in the sky. 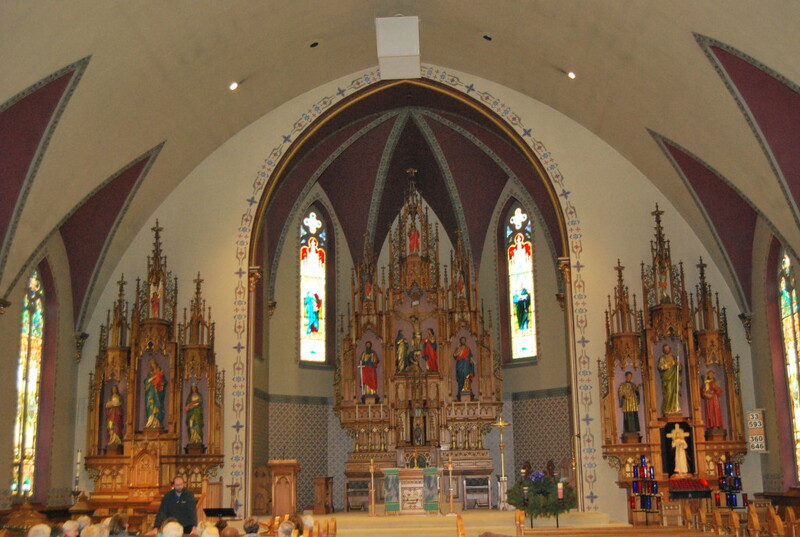 The altar was built in Germany and shipped over, and detailed stained glass windows line the sides. 2. 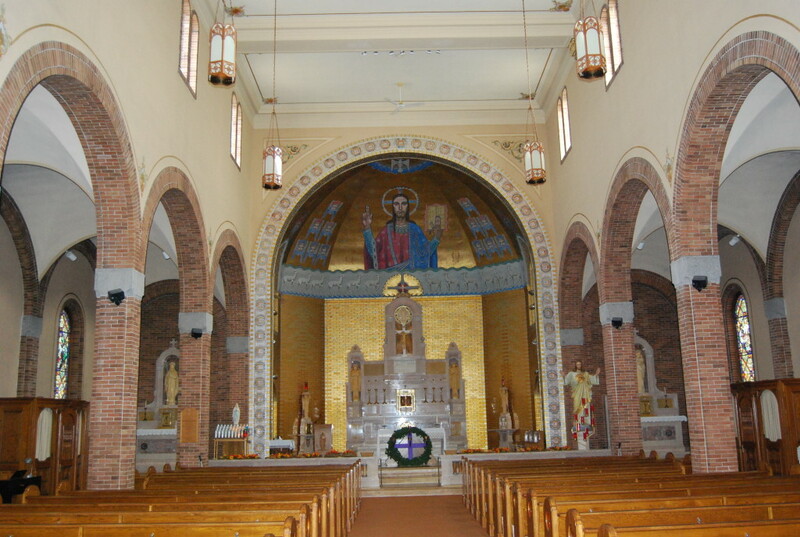 Church of Our Lady of the Angels, Sauk Centre, MN. The sanctuary dome of this church is one of the more unique and amazing displays of any church in Stearns County, possibly even in Minnesota. The church itself is somewhat basic, the outside design is classic Romanesque with a newer entryway addition off the front, and the nave of the church is open and somewhat plain. 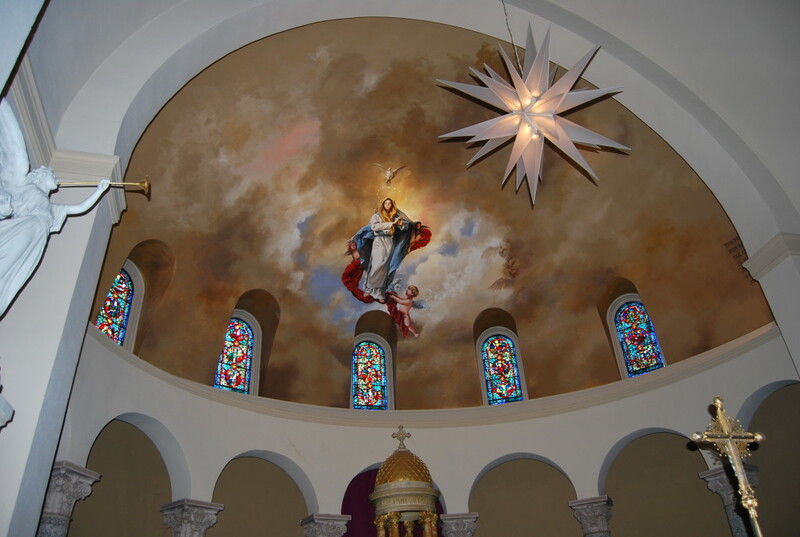 But the painted apse featuring Mary as an angel ascending from the clouds accompanied by cherubs is visually arresting, created by a local artist in 2004 who based it off of a work done by an Italian painter. After the original church burned to the ground on Christmas Eve 1924, this current building was completed a year later. 1. 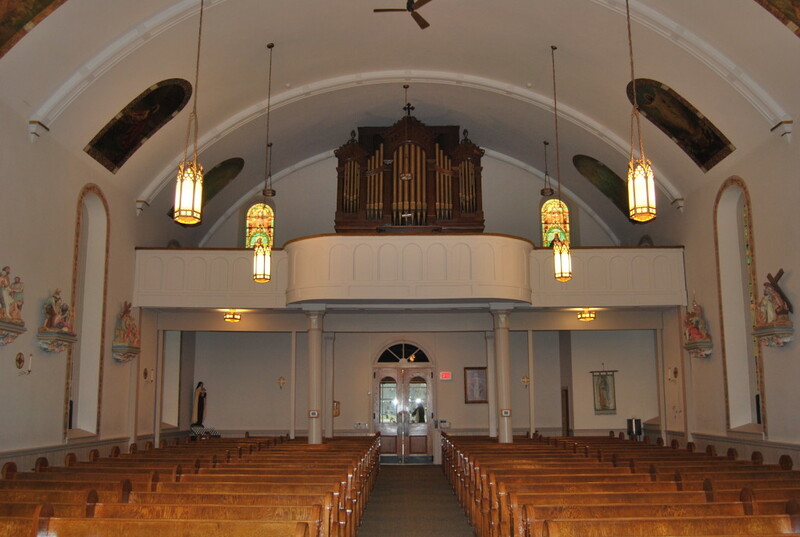 Church of the Sacred Heart, Freeport, MN. Easily the most impressive out of any of the churches we visited, the Church of the Sacred Heart in Freeport, built in 1925 after the previous one burned down, was also the most deceptive. The church, listed on the National Register of Historic Places, has a seemingly-ordinary façade that downplays the interior’s detailed beauty. Inside the church, the blue ceilings, complex stained-glass windows, gold-trimmed arches and stunning display of decadence is nothing short of a masterpiece. There is not an inch left untouched. 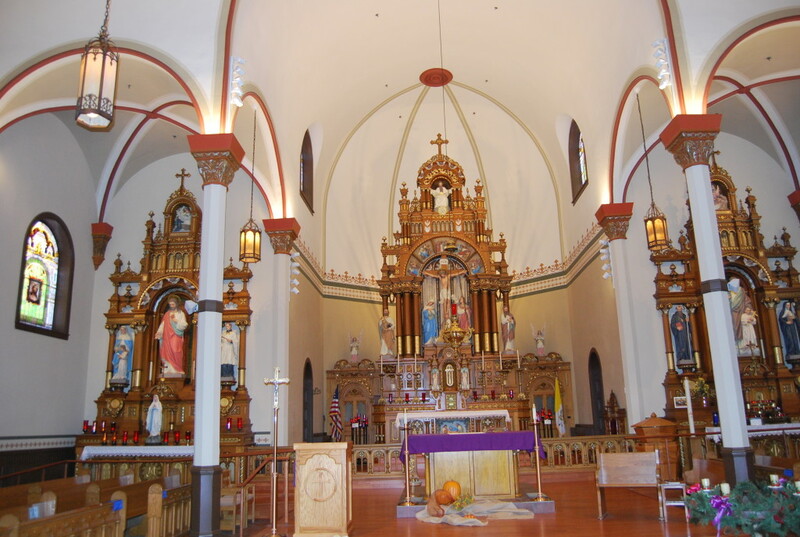 The altar and tabernacle are elaborate and even the Stations of the Cross, a Catholic church staple, are all handcarved and painted and maybe 12-ft tall each. Whether you practice religion or not, this house of worship is a true hidden gem, one of Minnesota’s best-kept secrets just out of view in a sleepy little interstate town. 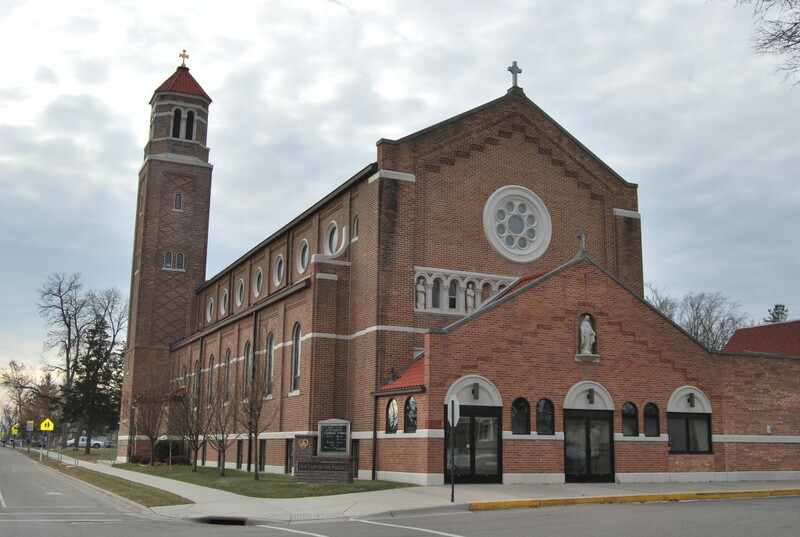 Honorable Mentions: St. Stephen, MN Catholic Church; Sacred Heart Chapel (College of St. Benedict); Church of the Immaculate Conception, St. Anna; Stella Maris Chapel (St. Johns University). John, thanks for reading. It was your book that inspired our trip around the county to explore them. Fantastic book and amazing churches. Hi, 35 years ago I worked in Stearns County for two years for the MN Ag. Ex. Service as a horticultural specialist and spent my days driving around Stearns County visiting gardens and yards. I fell in love with the towns and the beautiful churches. 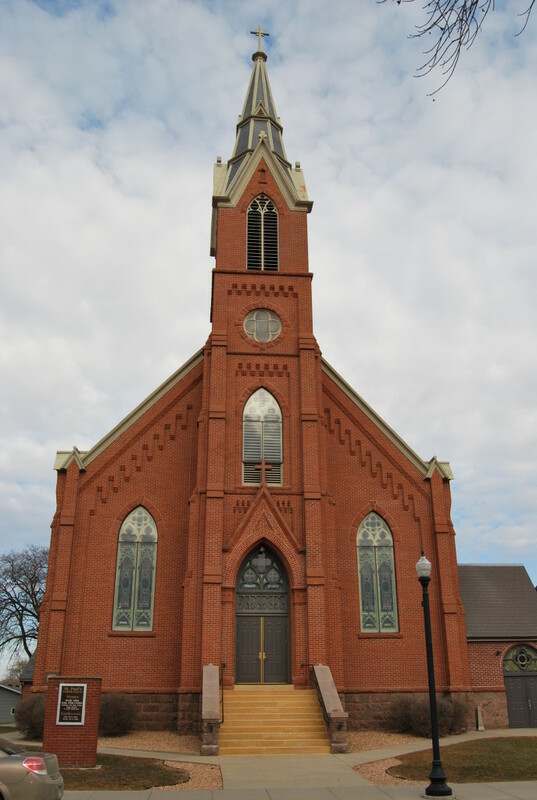 A couple of years ago my husband and I went back to Stearns County and spent the day wandering over the country roads, stopping at the towns, and going into as many churches as were open. We were just amazed at the beauty of the churches. This Saturday we are bringing a small group of parents and youth from our church to visit the churches. We are not Catholic but we enjoy looking at the beauty and artwork found in churches and how it is used as an expression of worship to God. I was trying to map out a route and found your website. I’m so glad you have discovered the churches. They are a treasure. I’m glad you posted your top ten because I couldn’t remember where all the churches were. Besides all the grand churches, I just love the Grasshopper Chapel in Cold Spring and of course, I hope you stopped at the Cold Spring Bakery while you were there. They have some of my favorite cookies! So, thank you again for your website and I am glad that you, too, have had the experience of visiting the churches. I have your Legacies of Faith, a beautiful and informative book. Thanks for researching and publishing it. I saw these churches in a new light through your eyes. 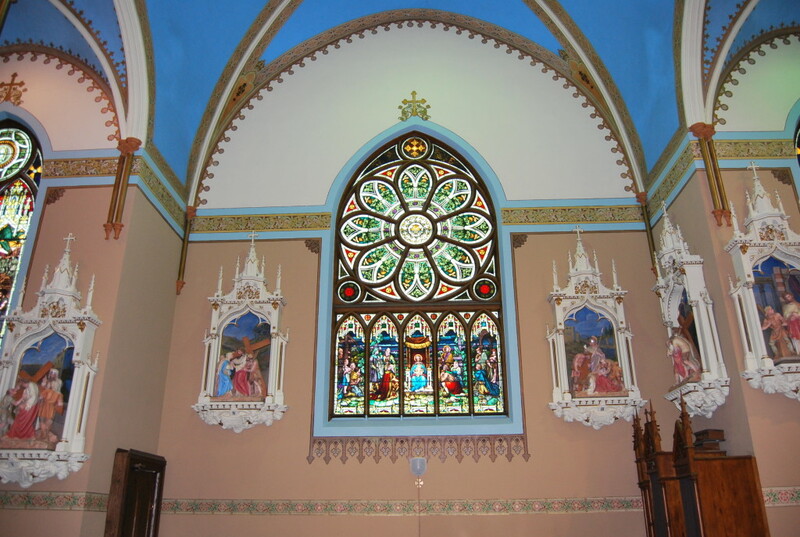 One of the most beautiful churches with elaborate stained glass windows was St. Catherine’s Catholic Church in Farming Minnesota. (Stearns County) Unfortunately, the St. Cloud Diocese closed the church. 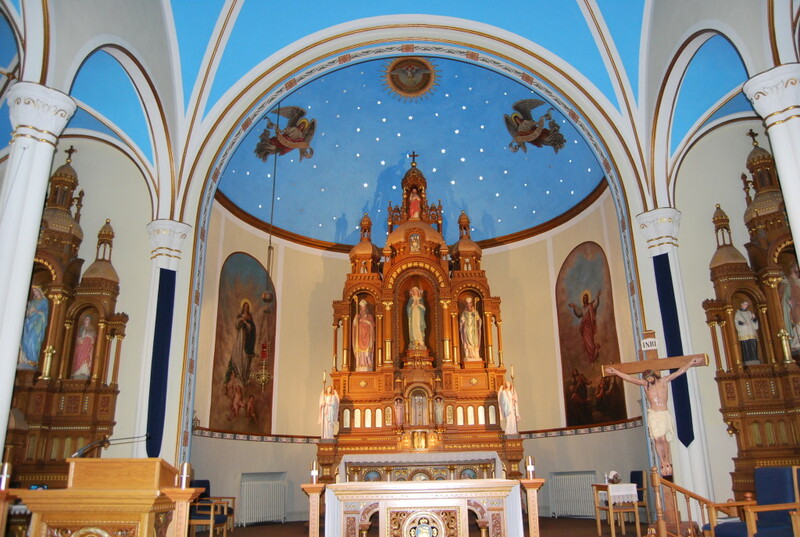 St. James of Jacobs Prairie has one of the most beautiful settings for a church–out in the country and overlooking the valley. 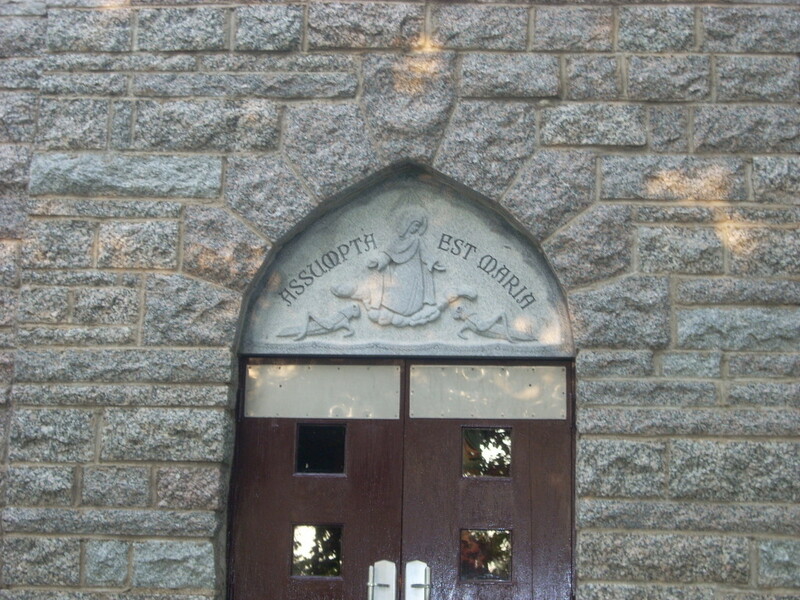 The outside of the church has beautiful stonework; the inside is pretty plain, though. I’m wondering if you only looked at Catholic churches? I personally think First Presbyterian Church in St. Cloud is one of the most beautiful churches in the area. 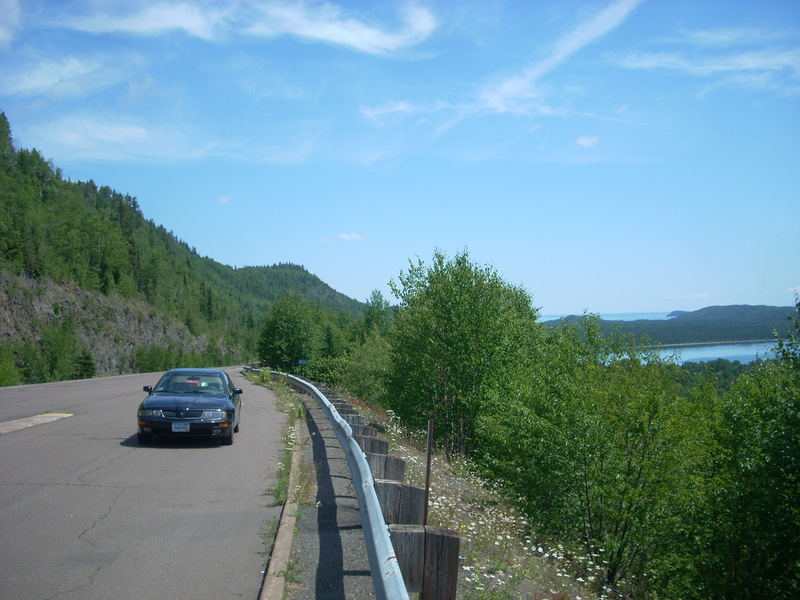 Barbara, Yes – our trip was strictly Catholic churches in Stearns County. I am crushed…the Church of All Saints…St. Hedwig’s in Holdingford didn’t make it??? Who picked these??? We used John Roscoe’s book “Legacies of Faith” to select the churches we had time to see in one day. St. Hedwig’s and several others did not make our list, unfortunately. This is where I grew up! I love these Beautiful Churches. I’ve seen all displayed in this posting. Where can I get this Book!? Thanks for sharing this with everyone. The book is available on Amazon, I have linked it in the article towards the top. I have a picture of my Dad when he replaced the cross on one of the steeples on the church of St Mary in Melrose, MN. In your description of St. Paul, Sauk Centre, for some reason you called it St. Michael. 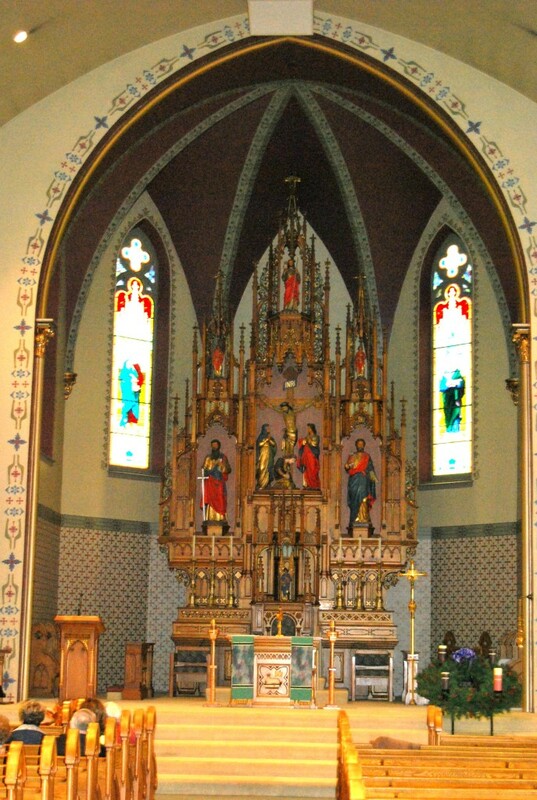 Thanks for including my church, Immaculate Conception, New Munich – that altar was also imported – from Italy tho. Thanks for checking out the article and letting me know of another typo! And yes, the Immaculate Conception church is amazing! Check out the church in St. Nicholas and Watkins! Both are beautiful!! I like the simple, plain looking churches without all the distractions. St. John’s is #1 on my list. I think the people in Stearns County don’t appreciate the beauty of it. This was like old home week for me. I was baptized and had my first communion at Sacred Heart in Freeport. Wish they still had the incredible wooded pulpit. The priest climbed up about 10 steps. Absolutely beautiful. 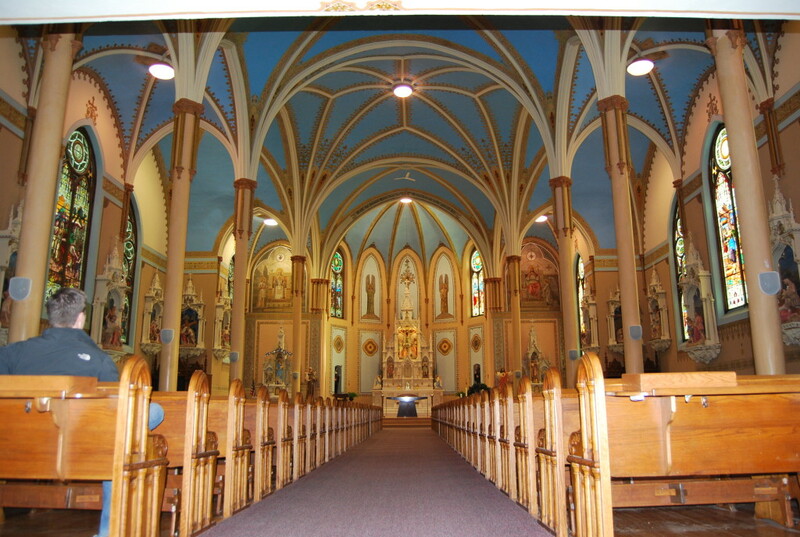 I went to Mass everyday at St. Mary’s in Melrose when in the Public Junior High. Beginnings of guitar masses. My family attended Imaculate Conception in New Munich. My family settled in Albany and attended Seven Dolors. My mom still lives in Albany. So incredibly disappointed that St. Stephen, in St. Stephen was an *honorable mention*. That church is incredible and frankly, far better than some of them mentioned in the list. I’m of course partial since I grew up in that church. But you obviously overlooked the incredible ceiling paintings and ornate sacristy. It’s too bad Vatican II ruined them all with their Nervous Disorder (Novus Ordo) Mess. Jennifer, I couldn’t agree more. That church in St. Stephen was the last one on our list and when we got there, it was about an hour before Saturday evening mass was starting and there was a large group of older women doing the rosary out loud. It would have been rude of us to start snapping photos and discussing the beauty of the church right there and then, and I never did get to make it back and photo it as I wanted to. Thank you for reading and for your comment, and I agree that so many were ruined with that Vatican II nonsense. What about the one down town? 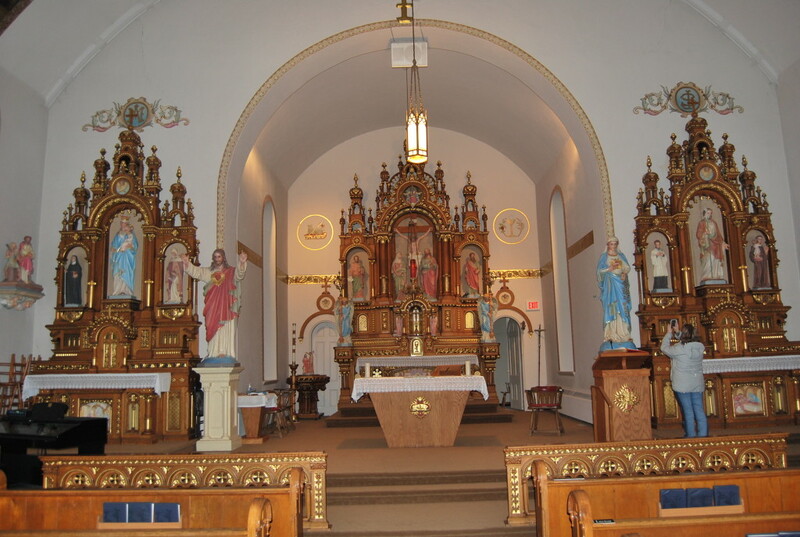 I think the Catholic Church in Farming, MN (township between Albany and St. Martin) deserves an honorable mention. The sanctuary brick in St John the Baptist Church in Meire Grove are not painted good, but covered in gold leaf. 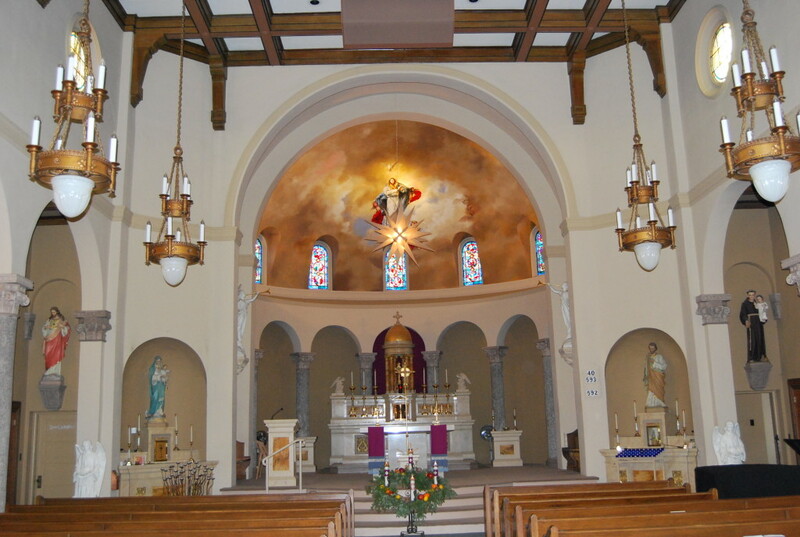 The rear alter, both side alters and the communion rail is all imported Italian marble. The current church is the third church building. The first was a wooden structure that was outgrown, the second was very “beautiful”, so much so that many at the time criticised it as being too flaunting, or show-off-ish. It burned when the janitor got the stove too hot attempting to keep the school children warm, as they stayed in town that night due to a blizzard. The children were not injured but the church was in ruins. The current church was built on the same foundation of stone but some in the southern part of the parish opted to build their own church, St Andrews, in Greenwald.